Hard work and responsibility have always been two of life’s biggest components for Carmen Ortiz. As the oldest of five children, she played a big role in helping her parents raise her younger siblings. Growing up in the projects of Spanish Harlem after her parents moved from Puerto Rico to the mainland about a year prior to her birth, Ortiz saw first-hand some of the many struggles her parents went through, as both worked multiple jobs to help make ends meet. Due to the fact that neither of her parents had a high school diploma and they spoke little of the English language, Ortiz had to work extra hard in school. These values instilled by her parents helped her go on to pursue her higher education and career, developing her skills in order to earn success and respect in her profession. When Ortiz was 16, conditions started to improve for her father, and the family moved to Long Island. Ortiz remained in the New York City area and continued her education there before attending George Washington University Law School in Washington D.C., where she earned her J.D. She later settled in Massachusetts, where she worked several years as a prosecutor, served two stints as Assistant District Attorney in Middlesex County and later became Assistant U.S. Attorney in 1997. After working her way up the ladder within the legal field, Ortiz made history when, in 2009, she became both the first woman and the first Latina to serve as the U.S. Attorney for Massachusetts. During her time in that role, she led the way in a number of notable prosecutions in high-profile cases, including the late former mobster crime boss James “Whitey” Bulger, pharmacist Tarek Mehanna, and Boston Marathon bomber Dzhokhar Tsarnaev. Bringing so many people to justice is something Ortiz has always been very fulfilled by within the national context of her job. “I felt so honored and so grateful to be in the position that I was in to be able to really contribute to something ... and help facilitate the process for those victims and witnesses,” she added. After leaving that post in Jan. 2017, Ortiz was named a rappaport distinguished visiting professor at Boston College Law School for the fall 2017 semester. She now works at the Boston law firm, Anderson & Kreiger, where her main focus is on internal investigations and white-collar defense. Ortiz enjoyed going to school and learning. Much of her time during her early years was divided between school and home. As a child, Ortiz often spent her free time watching TV. Reruns of the late 1950s and 1960s TV show “Perry Mason,” helped spark her interest in entering the law profession and becoming a lawyer. The show’s main character, Perry Mason, played a criminal defense attorney, and Ortiz recalls the many courtroom drama scenes present throughout the series. During high school, the idea of becoming a lawyer really began to take shape, and Ortiz started thinking more about the bigger picture. That mindset stayed with her as she pursued her higher education. During her time at GW Law, she took a course that shaped her decision to ultimately become a prosecutor, as opposed to pursuing another avenue of litigation. After graduating from law school, Ortiz interned and worked for the Department of Justice, where she met former Watergate prosecutor and Deputy Attorney General, and long-time Harvard Law professor, Philip Heymann, who had just received a grant to do a criminal justice project in Guatemala. At the time, Guatemala had a written justice system, where decisions of guilt or innocence were determined by simply reading a file. Lawyers didn’t have the opportunity to present their case, witnesses weren’t able to testify, and defendants couldn’t present their defense to the judge. Ortiz and Heymann stepped in and collaborated to work on making manageable reforms to improve the nation’s legal system. The goal was to create reform that would allow lawyers, prosecutors, witnesses and defendants all an opportunity to make their statements and argue their respective positions before the judge would then render a decision. After three years, the grant came to an end. While everything they hoped to accomplish didn’t immediately get done, some forward progress was made and Ortiz still thinks back very highly of her time in Guatemala. The Guatemalan judicial system has evolved greatly since the early 1990s, and a large part of that was due to Ortiz and Heymann’s work. In May 2009, while working as an Assistant U.S. Attorney, Ortiz received a “very powerful” phone call from then-Massachusetts Senator Ted Kennedy. “If you are still interested, Senator [John] Kerry and I would like to recommend you to President Obama to be our U.S. Attorney in Massachusetts,” Ortiz, who was one of three finalists for the position, recalled the late senator telling her over the phone. “If I am confirmed to be the U.S. Attorney, I promise you that I will make every single effort to make you proud,” Ortiz remembers humbly promising the late senator. “Well, I would expect nothing less,” Sen. Kennedy replied. The official nomination remained months away, however. In Sept. 2009, after going through a long process with the U.S. Department of Justice and White House Counsel, then-President Barack Obama made the formal nomination. About six weeks later, the Senate Judiciary Committee unanimously voted and confirmed the nomination, and Ortiz became the first woman and first Hispanic ever appointed as U.S. Attorney for Massachusetts. 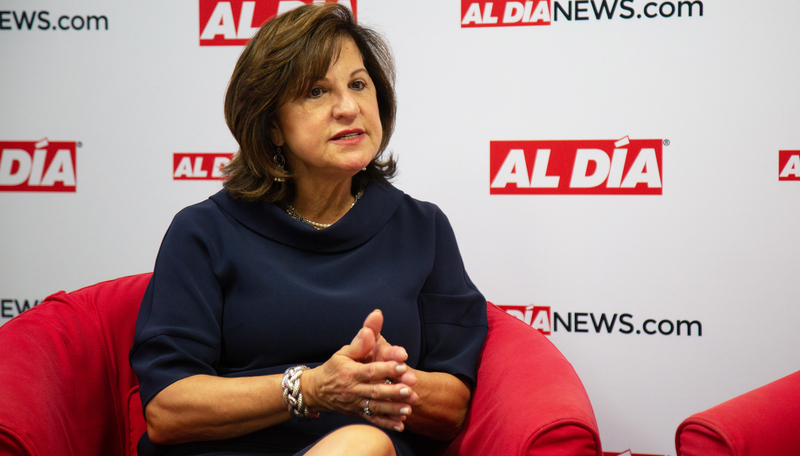 As U.S. Attorney, Ortiz managed and directed a number of cases, and while the pursuit and obtainment of justice were both priorities for that role, Ortiz felt she had an obligation to also do community outreach. “Yes, obviously, our jobs are to investigate and prosecute, and do the law enforcement piece, but I believe also our jobs are to do our best to work with communities and law enforcement to prevent crime, to intervene, and try to mitigate bad situations,” she said. That work resulted in creating a youth violence prevention program, engagement with numerous minority communities, and the set up of the first-ever Civil Rights Unit in Massachusetts. The distinction of being the first woman and the first Latina appointed as the U.S. Attorney for Massachusetts is a proud accomplishment for Ortiz. “But being the first woman and the first Latina, I felt that—not only did I feel a sense of pride, I felt that I could provide the sense of hope and also be a great role model for others that stood in my shoes,” she further explained. Ortiz never allowed the frequent discrimination and inequality that women often face in many fields—particularly in the legal field—hold her back, and she hopes her story will inspire more women, Latinas and other underrepresented groups to stay positive, be confident, go after what they want, and believe in their abilities. There will be roadblocks along the way—Ortiz faced her share, including losing her husband in 2000 after a lengthy battle with cancer, leaving her to raise two young daughters. However, Ortiz credits the support of her friends and family, as well as her work ethic and character, for helping her persevere, refuse to give up, and still find success. Working hard and having high character are two things she believes can greatly help others, as well. “If you really have a goal that you’re passionate about, then getting there should sort of make the process of working hard not so hard, because you know you’re working towards something,” Ortiz said of the approach she has taken throughout her life and her career.